Reviewer: Peter Viney: GCE “O” Level Physics (FAILED). I did get a Grade 7 … there were three fail grades, 7, 8 and 9, so I feel quite proud of that result. Michael Frayn? Great writer. Great reception on its initial award-winning 1998 runs in London and New York, and this 20thAnniversary production has the original director, Michael Blakemore and the original designer. It’s also in Chichester’s Minerva Theatre which is three-quarters in the round, therefore suiting the circular design. What? Do we actually want to know those details? Personally I got dizzy trying to remember whether it was Uranium 235 or Uranium 238 that was relevant in creating Plutonium, but got through it by mentally changing it all to Kryptonite. I never worried about its place in the atomic table while watching or reading Superman. Then we had read the synopsis and reviews (cerebral? ), and have to admit that had it been raining heavily we would have not bothered to go. I highly recommend the extensive Wikipedia entry on the play which covers not only the play, but the historical background and more recent discussions. My younger son (2.1 degree in Physics) said they went to see the original run in the first year at university and maintains that the 1941 meeting between Heisenberg and Bohr IS incredibly important in the history of physics. So what was it about? 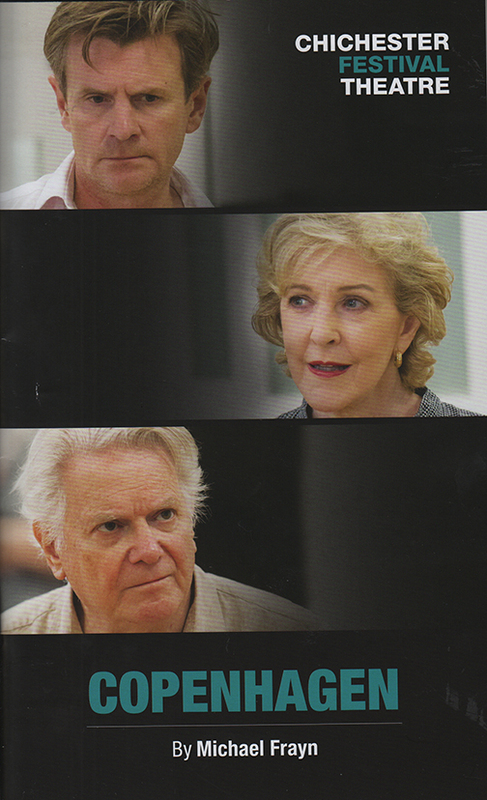 The play has Bohr (Paul Jesson), his wife (Patricia Hodge) and Heisenberg (Charles Edwards) all dressed in grey suits. They’re all dead and trying to remember the past, especially the events of September 1941 in Copenhagen. Bohr was the Danish physicist who was the “father” of nuclear physics. Heisenberg, who was German, had worked with him in Denmark from 1924 to 1927. Denmark was Nazi occupied in 1941, and as a (half) Jew, Bohr was in danger. Heisenberg went to great lengths to get permission to travel to see him. Their conversation caused a rupture in their relationship, and they have different memories. Memory shifts … it was September but Heisenberg remembers it as October with autumn leaves in a park under streetlights. But it was wartime. No streetlights, and the park was four kilometres away from the Bohr’s house. Margrethe is an observer, referee and later almost a judge, though the vital conversation occurred when the two men went out for a walk, assuming the Gestapo had microphones in the house. It hinges on the potential for weaponizing atomic fission. Heisenberg’s guarded questions reveal he has already spent two years on a project, and while he claims it’s a reactor, Bohr knows that reactors lead to bombs. Bohr realizes the Germans are working on a bomb, and that also Heisenberg is letting him know that. Why is Heisenberg asking? Does he just want to know if the Americans are doing the same? The first half ranges over their subsequent lives. Bohr escaped when the Nazis started rounding up Danish Jews in 1943, got to Sweden, then Britain then Los Alamos. Denmark did more to assist Jews than any other country. The ultimate point that Frayn presents is that Heisenberg either by chance, carelessness, inability, sub-concious or intent hindered the Nazi development of the atom bomb. While the moral Bohr got to Los Alamos (via Sweden in 1943) and helped perfect the A-bomb that hit Hiroshima and Nagasaki. How much is afterthought or retouching history? The play for me was its strongest as they argued the moral dilemmas, and recounted what happened to them later. They quote various physicists, and far too many names are thrown in for the non-specialist playgoer. I noted them quoting Oppenheimer’s regret that the bomb was not ready in time to try it on Germany before Japan. They also note that Germany is weak on theoretical physics, because theoretical physics was disregarded in Germany, so all the great ones were Jews … and had been forced to flee. A recurring theme is the death of Bohr’s son Christian by drowning. Bohr threw a lifebuoy, but didn’t jump in. Decisions. The end is particularly moving where Heisenberg recounts the harrowing final stages of the war against a projection of German ruins … created by conventional bombs. 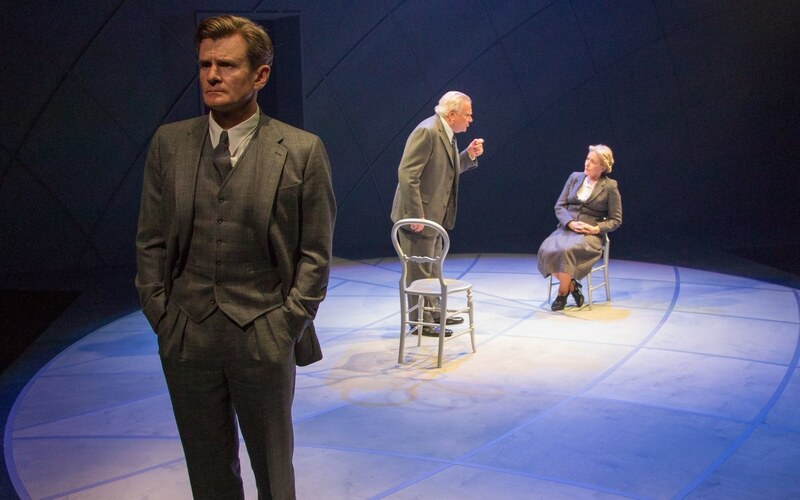 Michael Frayn has an extensive programme note on reactions to the initial play, which had led to the Bohr and Heisenberg families releasing correspondence that threw some new light on the events, which he notes. He says that he has corrected minor details for this production. I depart strongly from Michael Billington’s comment on the explanations of Schrodinger’s wave function and Uranium 235 v Uranium 238. I think Paul Jesson was right to get them over with with alacrity, as he did. I’ll add other points discussed … Schrodinger’s cat, Heisenberg’s Uncertainty Principle, Quantum Mechanics, Bohr’s Complementarity Theory. It’s all Kryptonite to me, and I suspect to many (most?) of those watching the play. I found the first part of Act Two an indigestible barrage of physics. Fortunately the last section of Act Two is very good. Act Two has that long physics lecture … if I was judging it as a Physics 101 Lecture it was a brilliant demonstration, but this is a play. My mind wandered away to the meticulous lighting plot. The white circle on the stage has elliptical markings all over it. I watched as pin spots hit every actor’s head perfectly. I looked down. They were standing on elliptical intersections as their marks. It struck me that the play required extensive lighting rehearsals as actors had to hit their marks with precision at times. I’m amazed at the “Best Play of 1998 Awards.” To me there has to be an Emperor’s New Clothes element there, either that or most theatregoers are far more scientifically oriented than I am … and I have struggled through The Tao of Physics but I also have one of the tens of thousands of pristine, unread copies of A Brief History of Time. If I were choosing a Michael Frayn play as one of the all-time greats, it would be Noises Off. But then our reactions differ greatly- I can’t understand a 101 Greatest list which excludes Martin McDonagh and Peter Barnes. I’ve had the A-bomb discussion at length – I’ve been to Hiroshima three times, I’ve been to Peace Park and the museum twice. The most harrowing thing is that people were not only destroyed, they were reduced to a faint shadow on the side of a building. Visiting it is a bone-chilling experience. As the American colleague with me at the time pointed out, the conventional firebombing of Tokyo (where he lived) on 9th to 10th March 1945 killed 100,000 and injured 1,000,000 and destroyed 1,000,000 homes. The figures are argued in a range of 75,000 to 200,000 deaths. Tokyo was a deadlier raid than Dresden, Hamburg, Hiroshima or Nagasaki as single events. Yet the Japanese were not moved to surrender. Then about 70,000 were killed by the atomic bomb on Hiroshima, and 70,000 injured. There were many subsequent deaths. The war ended. It was the instantaneous nature of the attack with a single bomb that made the difference. Estimates are that a conventional invasion of Japan would have killed vast numbers on both sides. Of course, you can’t put atrocities in a scale and balance them. However, my father had his orders to ship out to the Far East from Germany at the time of Hiroshima for an invasion of Japan. He didn’t have to go. And so I was born after the war. I might owe my existence to Enola Gay. The cliché is that nuclear weapons have prevented a major world war for 73 years, though if you live in Syria, Iraq, Yemen, Afghanistan, the former Yugoslavia, Vietnam, Cambodia or areas of Africa, or lived in China during the cultural revolution, that will seem academic. Here in the privileged West it has worked. Now we fear minor powers run by mentally unstable leaders getting the bomb. I’d add that the two great powers now also have unstable leaders. The play is very different. The cast all deliver accomplished, nuanced performances at the highest level. The direction and lighting are meticulous. At times the script was enthralling, but for the lay person, it really does go too far into the science. It was also our third “Small cast / all talking” play in a row and it’s not my favourite theatrical genre. I think that original critic is absolutely right, in spite of the excellent body language and expressions from this cast. A great radio play.